NewSouth Books would like to commend the journey of the 2011 Student Freedom Ride, which will mark the 50th anniversary of the Freedom Rides through the South. The program is composed of 40 college students from over 30 states, chosen by American Experience, whose goal is to spark a national debate concerning the role of civic engagement in today’s society. The group will travel the course laid out by the original Freedom Rides, arriving in Anniston, Alabama, on May 11. While there, they will meet Rev. J. Phillips Noble, who will give the riders autographed copies of his book, Beyond the Burning Bus: The Civil Rights Revolution in a Southern Town, which discusses the effects of the Anniston bus bombing of 1961 on that small Southern town. The tour will then journey onward until they reach New Orleans, Louisiana, on May 16 for the premiere of the film Freedom Riders on PBS. The 2011 Student Freedom Riders include: Maricela Aguilar, Liliana Astiz, Stephanie Burton, Meghna Chandra, Sarah Cheshire, Michellay Cole, Collis Crews, William Dale, Peter Davis, Rajlakshmi De, Rachael DeMarce, Francisco Diaz, Doaa Dorgham, JoyEllen Freeman, LeRoy Ford, Lu-Anne Lopez Haukaas, Marshall Houston, Bakhrom Ismoilov, Esther Kim, Davis Knittle, Diana Mahoney, Jason McGaughey, Tariq Meyers, May Mgbolu, Anna Nutter, Carla Orendorff, Ryan Price, Benjameen Quarless, Charles Reed Jr., Nathan Roberson, Robert Sgrignoli, Erica Shekell, Alicia Skeeter, Tania Smith, Michael Tubbs, John Walker, Zilong Wang, Jayanni Webster, Kaitlyn Whiteside and Samantha Williams. In Beyond the Burning Bus, Phil Noble recounts Anniston’s decision to form the biracial Human Relations Council, which he chaired, after the Ku Klux Klan firebombed a Freedom Riders bus. In response to that incident, a few black and white leaders in Anniston came to the conclusion that desegregation was inevitable and it was better to unite the community than to divide it. The book includes many powerful photographs from that period. Learn more about the 2011 Student Freedom Ride at www.pbs.org/freedomriders. Visit the official Anniston, Alabama website at www.spiritofanniston.com. Beyond the Burning Bus: The Civil Rights Revolution in a Southern Town by Rev. J. Phillips Noble, is available in hardcover and ebook formats from NewSouth Books, Amazon, or your favorite local or online book retailer. Watch the full episode. See more Freedom Riders. In a case of the acorn not falling far from the tree, Phil Noble Jr., son of the author of NewSouth’s 2003 memoir Beyond the Burning Bus — about the civil rights movement in Anniston, Alabama — is launching an international website, Hope Plus, that promotes social politics. Phil Jr. grew up in Anniston, which gained infamy in 1961 when a KKK-led mob attacked and firebombed a bus carrying Freedom Riders across the South in a test of the Kennedy administration’s commitment to enforcing new regulations barring segregation in interstate travel. Phil Sr. was the pastor at the time of the Presbyterian church in Anniston, and he subsequently was one of the leaders of efforts to undo the racial tension and to peacefully desegregate Anniston. He describes this historic effort in his critically acclaimed memoir. Phil Jr., meanwhile, grew up to become a leader in progressive politics in South Carolina and Washington. He has become an expert at using technology and social networking media for good causes through PoliticsOnline. The Hope Plus web portal will extend these good works internationally by offering “online tools to enable social projects such as building schools and fighting pollution.” According to the BBC, the site will launch in December at the Copenhagen Climate Change conference. Noble was pastor of First Church in the picturesque town of Anniston, nestled in the foothills of the Appalachians. He had been pastor of the church for nearly five years when Mother���s Day dawned on 14 May 1961. It would be a defining day for the nation, the state of Alabama, and, most especially, the town of Anniston. As the nation awoke and people turned on their television sets, they were confronted with what can only be described as apocalyptic images of a Greyhound bus burning on the outskirts of Anniston. And, like all apocalyptic images, it lifted a veil for the whole country on the depth of violence brewing in the south, and invited a response. The burning bus changes this reality for Noble and he responds by seeking to build bridges across the violent chasm existing between him and his AfricanAmerican colleagues. He has an initial meeting with Bob McClain, an AfricanAmerican Methodist minister, where the contours of the crisis are discussed. This leads to a larger meeting with Nimrod Reynolds at an African- American church. Noble is surprised to discover that he does not even know the exact location of this church facility, even though he has lived in the community for over five years, again shining a light on the state of things at that time. But, in addition to learning new maps that included African-American parts of town, this small group of ministers was determined to learn how to love one another and engage in social action in Anniston. The public library in Anniston was desegregated, thanks to the work of the Human Relations Council, with the support of the city government. On the day when the first African-American patrons were to go to the library and check out books, members of the KKK and their supporters arrived, and violence ensued. Nimrod Reynolds and Bob McClain were attacked by a mob and beaten with sticks and chains. Read the full review at the Presbyterian Outlook. Beyond the Burning Bus is available from NewSouth Books, Amazon.com , or your favorite local or online book retailer. As reported Wednesday, Jan. 24, 2007 in the New York Times, James F. Seale has been arrested in Roxie, Mississippi, in connection with the murders of two African-American men, Henry H. Dee and Charles E. Moore, in 1964. Seale is alleged to have been a member of the Ku Klux Klan. The FBI believes Seale and others suspected the two men of planning an “armed uprising,” while in fact they may just have been hitchhiking in the area. The history of the world is littered with examples of “man’s inhumanity to man.” High up on the list is the ignorant, prejucice, and hate driven horrific crimes committed on African Americans during the 1960’s. Many were people who were not involved in Civil Rights activity, but innocent bystanders who became the objects for violent treatment just because they were black. Time brings some healing of hurt to families of these victims, but it does not entirely remove it. However, time does not negate the need for justice for those who perpertrated cruel violence to innocent victims. I am immensely proud of my fellow Mississippian, former Gov. William Winter, who was a voice for tolerance and moderation in an atmosphere of bigotry and hatred during the 1960s, and others like him, and I continue to be appalled at the depths of hatred to which some of my fellow Mississippians could sink as they carried out their evil deeds. I am grateful that the wheels of justice continue to grind in my native state. Rev. 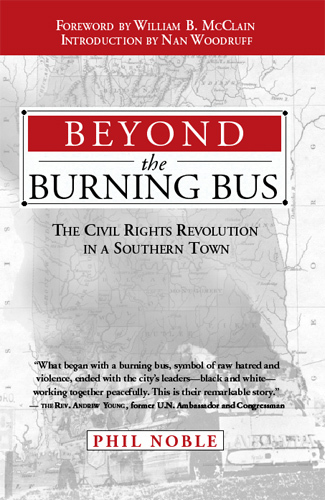 J. Phillips Noble wrote about his experiences struggling for civil rights in Anniston in his book Beyond the Burning Bus, available from NewSouth Books, Amazon.com , or your favorite local or online book retailer. You are currently browsing the archives for the Beyond the Burning Bus category.